New Delhi, Metro Rail News: Today, the first trial run of the country’s engine-less train will be conducted today on the Bareilly-Moradabad section. 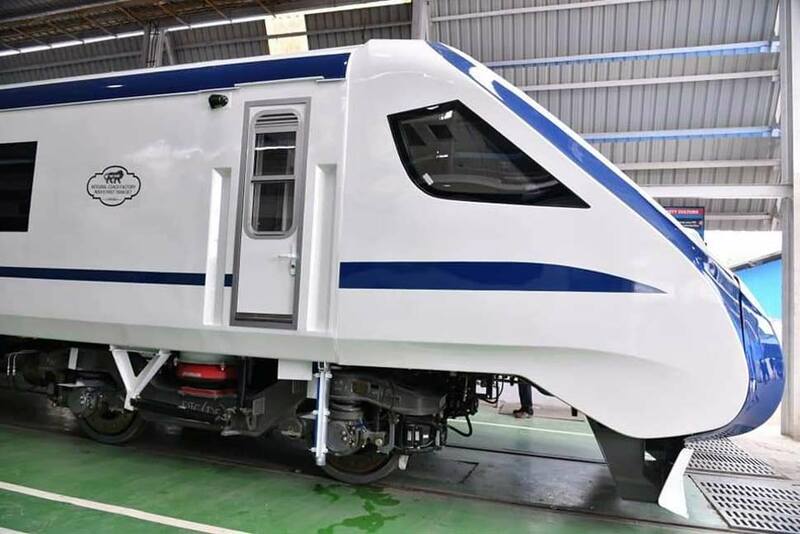 Developed by the Integral Coach Factory, “Train 18” is seen as a successor to the Shatabdi Express and was unveiled last month by Ashwani Lohani, the chairman of Railway Board. This train has been specially designed on the model of bullet train. The train is fully air-conditioned train and is driven by a self-propulsion module, that can run at a speed of up to 160 kmph and comes with technical features for enhanced quick acceleration. The Research Designs and Standards Organisation’s team has reached Moradabad for the trial run. This Rs. 100 crore train is the first long-distance train without a separate locomotive or engine.T-18 train are completely Indian and they will be fully computerized. On Friday, the railways sought to downplay reports that the train had developed glitches, saying they were minor and such issues were routine during the trial phase of any train. A railway official said, “Some fuses went off while conducting the low-speed run in the city (Chennai). They were fixed immediately. There was nothing to worry about,” as quoted by PTI. “It is a matter of pride that India has made such a train for the first time and that too ICF has done it within 18 months,” Mr Lohani had told reporters when the train was unveiled last month. “Within 2018-19 production year another unit of the train would be manufactured and four more units would be manufactured by end of 2019-20 production year,” Mr Lohani said. Due to its being built in 2018, it has been named T-18. This will be the first train set of the Indian Railways, which will be similar to the metro, i.e. the engine will not be separated, but it will be run only in the first and final coach of the train. Because of its stainless steel coaches, not only will it be lightweight but they will be able to run at a fast pace. Earlier it was a discussion to run between Delhi-Bhopal, but now it has been connected to Moradabad instead of Bhopal. It has been built on the lines of the century. This 16-coach train set is based on world-class standards and is fully developed on Indian technology and design. The first modern train will be introduced in the new year. Several features have been added in this train set, including WiFi, LED light, Passenger information system etc. The Government first announced in the Rail Budget 2014 for running semi-high speed trains on nine routes of the country. These included Delhi-Agra, Delhi-Chandigarh, Delhi-Kanpur, Nagpur-Bilaspur, Mysore-Bangalore-Chennai, Mumbai-Goa, Mumbai-Ahmedabad, Chennai-Hyderabad and Nagpur-Secunderabad routes. That being said, that remains substantially 100 crore train developed in India, energy saving These will change the style of a train in the train coming. Sources said that this carriage is a milestone in the history of Indian Railways.